Every year, the Global Education Interact (GEI) by the Chopras help hundreds of student study abroad by giving them the platform to explore the options of studying in top universities from across the globe. How? During the Global Education Fair, top universities from across the globe gather under one roof to meet and interact with students. The Global Education fair is scheduled to come to Pune on 5th Feb at Sheraton Grand from 11am to 5pm. Book your seats in advance now. So, what has GEI 2019 got to offer? 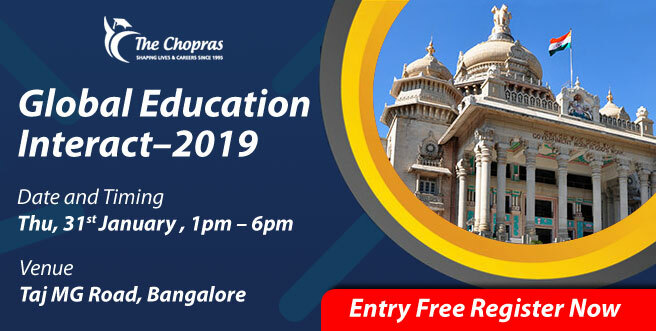 Over 75 globally ranked universities from across 9 top study destinations are all set to participate in the education fair 2019. Aside many other perks of attending the education fair, during the GEI, students who have started their application process as well as those who haven’t yet, gets the opportunity to have detailed conversations here their best options are assessed free of cost! These highly ranked universities are from top destinations in the world, i.e. If you are still under the process of shortlisting country/university, you can check more university names here. ·19 Meet country experts: One of the perks of attending the GEI is the detailed discussions where issues are discussed and best options are assessed by country experts and highly trained counsellors. During the GEI, a team of experienced relationship managers are available for free consultation so that when the student meets the university delegates, they are clear on their options. ·28 Information on education loan, visa application etc: As the attending student get the opportunity to discuss at length, it gives the right platform to get detailed information on the issues of visa application so that last minute delay or careless mistakes could be avoided. GEI is also the right place to get more information on availability of education loan, financial aid and more. Don’t forget to register for the GEI!